Here's a favorite from the archives! Who can resist those gorgeous squashes stacked in groceries and farmers markets this month? And they are SO good for you. Don't miss my soup hack for an easy and delicious Curried Butternut Squash Soup. Isn't it nice when life can a little easier? I’ve got a (delicious!) culinary cure, brought to you by the letter “A” and the color orange. Digestive health & detoxification (can help the body get rid of pesticides & microorganisms). It’s best to obtain vitamin A through your diet, not supplements. Why? Because it’s a fat soluble vitamin, meaning that it’s best absorbed along with some healthy fat, such as olive oil, coconut oil, coconut milk, or ghee (clarified butter). Looking for food sources? Vitamin A is conveniently found in anything orange and anything green, such as all winter squashes, carrots, kale, and collard greens. Are some of those amazingly-shaped winter squashes in the market strangers to you? Make friends! Winter squashes play multiple culinary roles with ease: travel to Italy, roasting squashes with apple and sage. Go Middle Eastern, channeling star chef Yotam Ottolenghi, and adding cumin. Chop and add to Indian or Thai curry. Or go Americana and mash with ginger, cinnamon and orange. Oh, yum!!! Butternut - the Italian version of pumpkin, shaped like a long-waisted pear with creamy-tan skin. Delicious roasted with apples and sage (and see soup recipes below). Delicata - long and pale, creamy yellow with green stripes. You don’t need to peel this one! Sweet when cooked, wonderful in soups or sliced and roasted (see recipe below). Kabocha - the Japanese word for pumpkin. A rounded, dark green squash with orange flesh combining flavors that are nutty, earthy and sweet. Also an orange-skinned, sweeter variety. Wonderful simply roasted with olive oil and sea salt. Whole, winter squashes will keep a month or even two in a cool place in your pantry or kitchen; chopped raw or roasted, in an air-tight container in your fridge for up to 5 days; or in your freezer all winter long. Handy! In a hurry? Watch and learn a speedy roasted squash soup blended with spices (I used pinches of ginger, turmeric and cumin), coconut milk and lime. Results? Yum! CLICK HERE FOR THE CURRIED BUTTERNUT SQUASH SOUP RECIPE! I received an avalanche of rave reviews when my cookbook The Longevity Kitchen came out and I added this to My Recipe Box. Understandable! You don’t have to peel delicata squash; just cut it in half, scrape out the seeds, slice, roast and serve. It looks gorgeous on the plate. A tasty triumph! 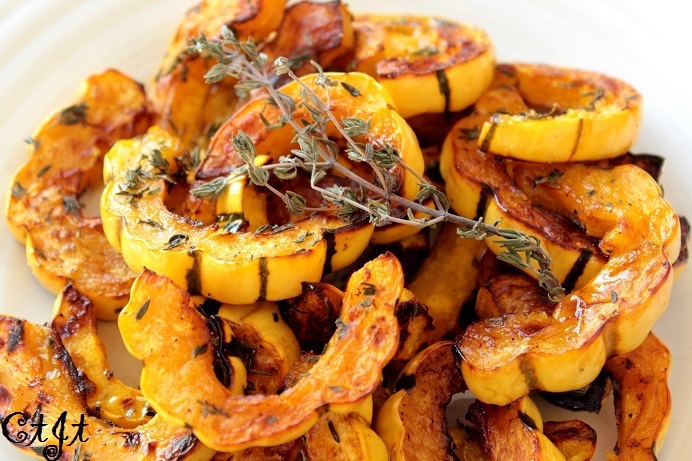 CLICK HERE TO TRY ROASTED DELICATA SQUASH WITH ORANGE AND THYME! A final note: winter squashes are incredibly grounding for us humans, perfect when we’re stepping into fall and winter. According to Traditional Chinese Medicine, they are especially are strengthening for the lungs, which tend to be vulnerable as it gets cold and starts to snow or rain. Enjoy these warming squashes full of vitamin A that protect your immune system during transition, fall and wintertime. Note: If you really want to geek out, explore Michael Murray, Joseph Pizzorno and Lara Pizzorno’s book, The Encyclopedia of Healing Foods (aka, my healing foods bible.) Superb information. And for more winter squash options (and recipes), enjoy this Visual Guide to Winter Squash from epicurious.com. COMMENT BELOW AND TELL ME: ARE WINTER SQUASHES NEW TO YOU? OR, DO YOU HAVE ALL-TIME FAVORITES? ANY CULINARY HACKS TO SHARE? AND WHAT ARE YOUR QUESTIONS? I LOVE YOUR QUESTIONS! Older Post Start with soup!